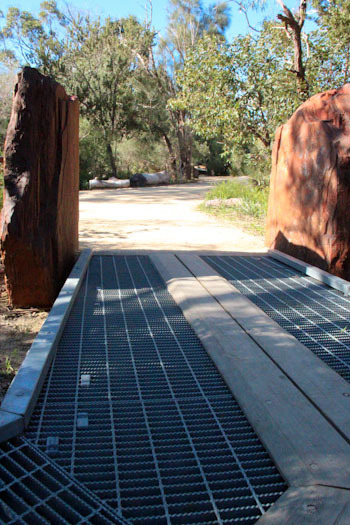 Take a natural bushland area, add some industrial accessories designed to entice city kids off the footpath and into the wild, and you end up with Naturescape. 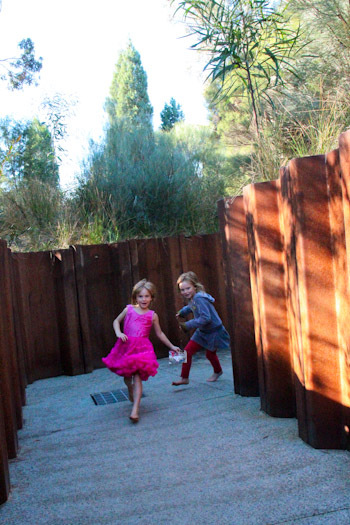 Today we spent a couple of hours exploring this award-winning addition to Perth’s famous park. Would you queue up to play in bushland? The designers of Naturescape certainly think so. 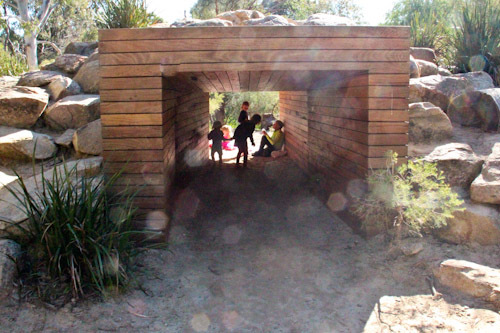 They've taken a modern sculpture of a chrysalis and used it at the entrance to provide shade for the crowds who may be waiting for their turn to enter the playspace. 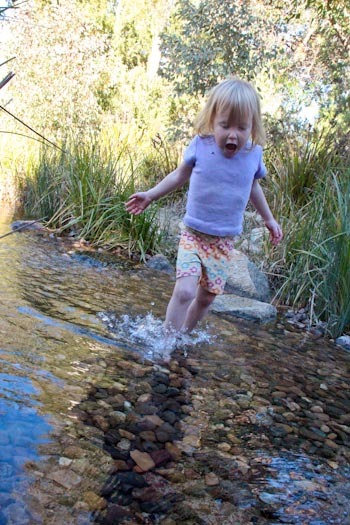 Numbers of entrants are limited in peak periods, so it's possible that people would wait for a while to give their kids a chance to play in a natural environment. At over 1000 acres, Kings Park and Botanic Garden is one of the largest inner-city parklands in the world. Within walking distance of the CBD, it overlooks the Swan River and contains grassy parklands, botanic gardens and native bush. It also has a number of play spaces, and this one (whose name has been sold out to a multinational metals and mining corporation) looks the least like a traditional playground. 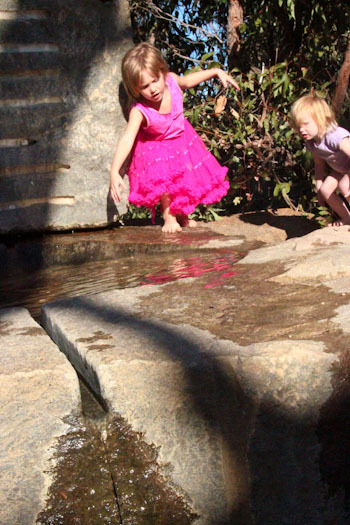 Naturescape provides a comprehensive "bush" experience for urban families. There are even snakes about! Today Calista is determined to navigate us around the layout with the help of the vague map. 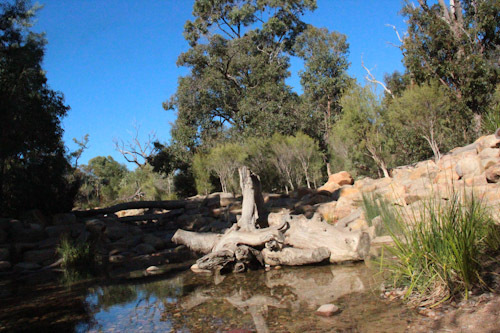 Great ironstone boulders, stony paths, giant logs, water courses, piles of rocks and cleverly crafted hidey-holes are nestled among Australian native trees. 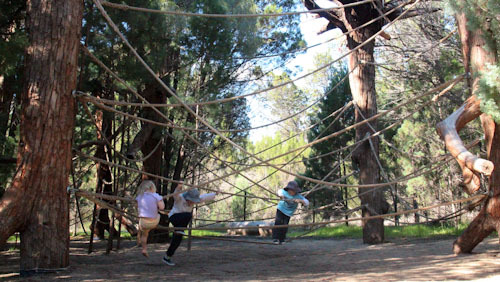 The site was originally planted as an arboretum in 1962 and only opened as a playspace in late 2011. A large concrete bed is filled with this very coarse sand — dolomite, perhaps? 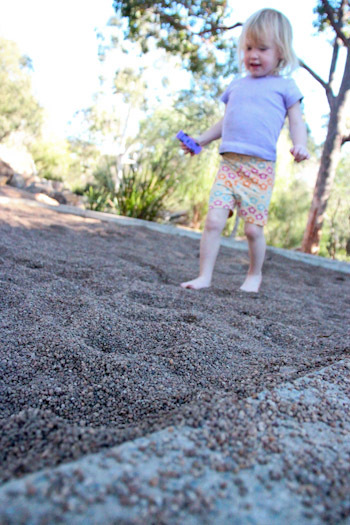 — providing a new sensation and texture for children who may only be accustomed to beach-sand. 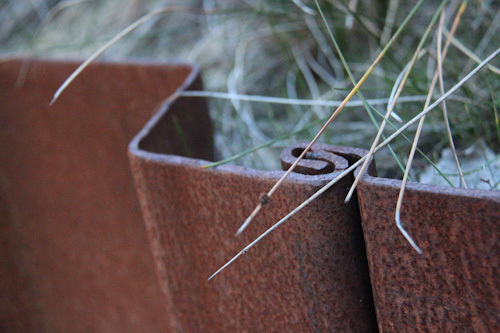 One section of the bush has four piles of industrial metal and a sign briefing children to build four different bush-cubbies with different layouts, materials and entrances. Manou joins us for a little picnic in the shade of a tunnel. Steel boardwalks (is that an oxymoron?) link different spaces. The ironstone boulders were moved here from Jarndrumnhna in the East Pilbara Region of Western Australia. 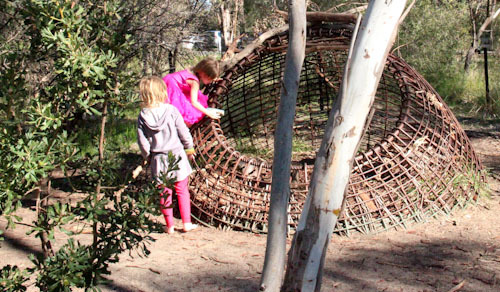 Steel "nests" in the Prickly Thicket await children's adornment with the natural materials that surround them. The girls try climbing on the nest but find it too prickly. The steel nests frames remind me of the papasan-chair frame that I rescued from the road-side and turned into a giant nest at our friends’ house in Brisbane. Their son obligingly posed as the cutest little bird, and my creation was complete! A "gully" walled by iron zig-zags below ground-height and bounces our voices back at us as we chase each other along its length. The thick iron corrugate connects to each other with overlapping lips. Lana has a good go on the slack ropes which are really more suitable for older children. They are suspended from upside-down trees. 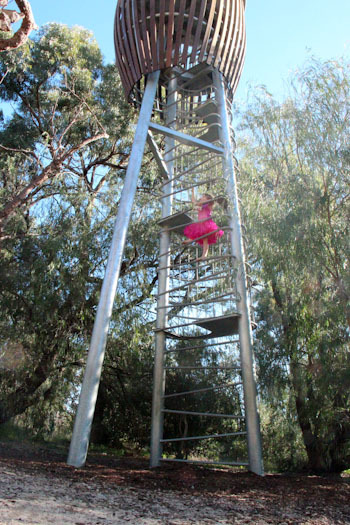 Three towers ("tree hides") provide intense climbing opportunities. Although there are water-ways within Naturescape, the water quality is not monitored and thus swimming or drinking is forbidden. It’s easier to forbid something than to actually act to make it safe (as a parent, I still fall into that trap). But at least the sign-designers display a sense or humour. Phrased this way, the sign is still authoritative without being overbearing. 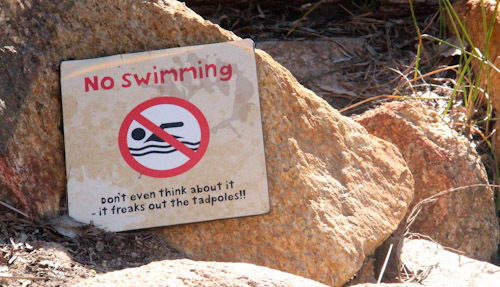 But paddling *is* permitted in Paperbark Creek! A stony bottom makes it easy to navigate the shallows. In another section, a shallow dish is hollowed out in a large granite boulder, collecting water from a "spring". 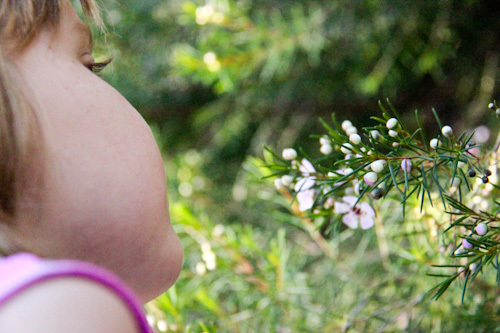 On the way out, we stop to examine the tiny white and pink buds of the Geraldton wax. Our girls were interested in the different areas of Naturescape, but not thrilled by it. 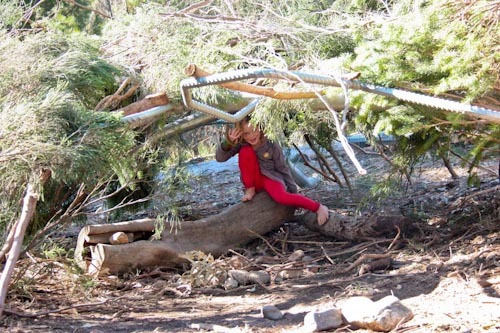 We’re used to playing in the real bush and in this playspace, the artificial elements were more appealing than the natural features. 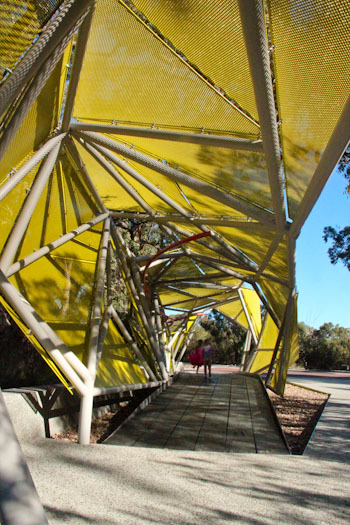 However, Naturescape is an excellent addition to Perth’s botanic gardens and certainly provides an opportunity to correct young urbanites’ “nature deficit disorder” (the term popularised by Richard Louv) and cited as an inspiration for the project. Please note, Naturescape is not open on Mondays. 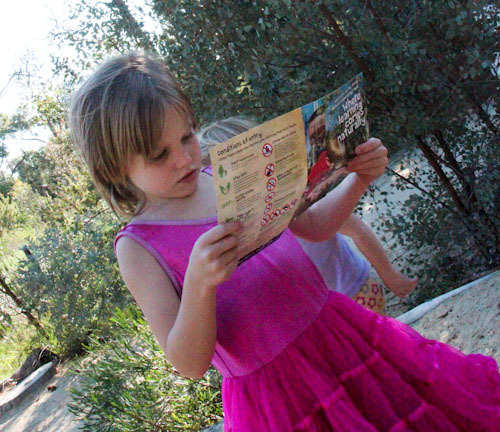 We’ve already been there twice — on Mondays — and have had to look for other options (not so hard in Kings Park). Aisha’s theory is that the play area is so good that they close it weekly so that the people who work here can enjoy it! She may be right! I cannot begin to tell you how much I enjoy coming on your adventures with you once again. It’s so good to hear the girls enjoyed Naturescape, I’ve been past it but not had children with me to play there. I was hoping you’d review this area! My girls are Dino mad so always request the dinosaur play area, but one day we’ll get to this one! 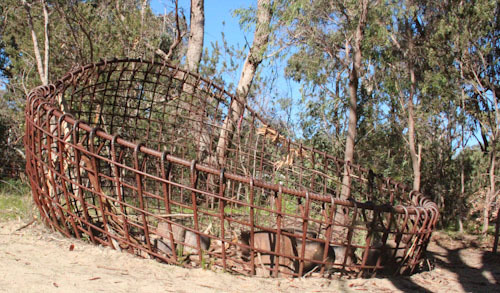 Have you got plans to hit the Manjimup play area when it opens soon?